Free note-book and pen with every Steel Door sold in Jan. I trust you’ve had a good break, feeling refreshed and ready for another exciting year ahead. The economy is fairly stable and despite the uncertainties surrounding Brexit, PwC still predict 1.6% GDP growth in 2019. The Construction Products Association forecast construction growth to increase to 2.3% in 2019 and last year, Barbour ABI reports that £3 billion worth of contracts have been planned for warehouses across the UK. This means that there will be plenty of door requirements in 2019 & 2020. At Metador, we are preparing for some big and exciting changes this year. Our amazing new factory and office extension will provide us with another 20,000 sq ft and will be filled with the latest CNC machinery to enable us to stay ahead of the game, produce doors in the most efficient way, making our service faster, smarter and more cost-effective for you. Recent innovations include our new flush vision panel system, high-security louvres and a very cost-effective multipoint locking doorset. This year will see a launch of a new range of acoustic doorsets and new fire-rated doorsets with more sizes and options than ever before. Please contact us for any enquiries you have, and we will give you our best attention – as always! 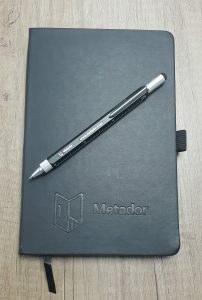 For every order received before the end of January 2019, we will send you our branded notebook & pen for free! Offer starts 20th January 2019 and ends 31st January 2019.